President Donald Trump meets with Prime Minister Justin Trudeau of Canada in the Oval Office at the White House on February 13, 2017 in Washington, D.C.
(CNN) - President Donald Trump and Canadian Prime Minister Justin Trudeau had a testy phone call on May 25 over new tariffs imposed by the Trump administration targeting steel and aluminum imports coming from Canada, including one moment during the conversation in which Trump made an erroneous historical reference, sources familiar with the discussion told CNN. The problem with Trump's comments to Trudeau is that British troops burned down the White House during the War of 1812. Historians note the British attack on Washington was in retaliation for the American attack on York, Ontario, in territory that eventually became Canada, which was then a British colony. When asked if the comment was received as a joke, one source on the call said: "To the degree one can ever take what is said as a joke. The impact on Canada and ultimately on workers in the US won't be a laughing matter." The White House declined to comment and the National Security Council did not immediately return a CNN request for comment. Asked about the state of US-Canada relations, National Economic Council Director Larry Kudlow acknowledged some short-term tensions, but said he believes relations between the two countries remain "very good." "I have no doubt that the United States and Canada will remain firm friends and allies whatever short-term disagreements may occur," Kudlow said. Trudeau has publicly denounced the "national security" justification for the new tariffs. 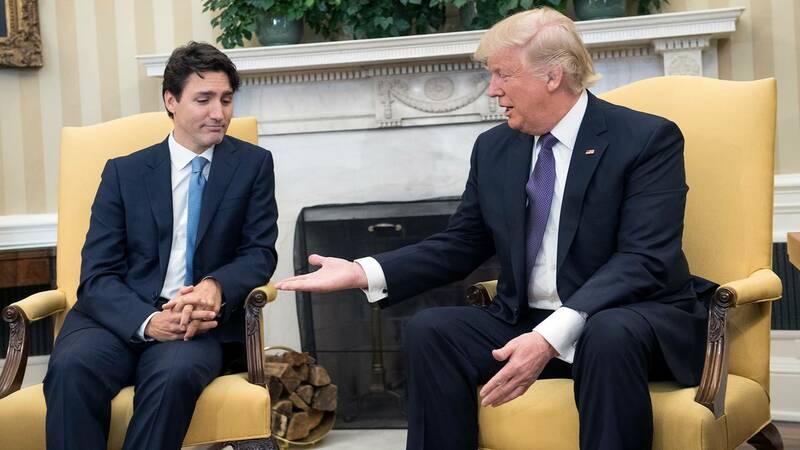 "The idea that we are somehow a national security threat to the United States is, quite frankly, insulting and unacceptable," Trudeau told NBC's Meet the Press. Canada's Minister of Foreign Affairs Chrystia Freeland questioned the Trump administration's move on CNN. "And I would just say to all of Canada's American friends -- and there are so many -- seriously? Do you really believe that Canada, that your NATO allies, represent a national security threat to you?" Freeland asked on CNN's "State of the Union." Freeland met with Senate Foreign Relations Committee Chairman Bob Corker Monday to relay Canada's concerns regarding the tariffs, a Corker spokeswoman told CNN. "There is no reason to use this provision to consider imposing tariffs on the automobile industry, and this appears to be either an attempt to affect domestic politics ahead of the election or for some other transactional purpose regarding ongoing trade discussions. This is a dangerous course and should be abandoned immediately," Corker said in the statement. "The United States must, at long last, be treated fairly on trade," the President tweeted on Saturday. A senior administration official declined to discuss the specifics of Trump's phone call with Trudeau but acknowledged some of the President's conversations with his foreign counterparts on the subject of trade have been confrontational. "It's understandable that change causes friction," the official said, noting some of Trump's recent tariff announcements have brought stubborn trading partners back to the negotiating table. In April, Canada tried to address what Trump said were concerns about Chinese steel and aluminum being dumped into Canada and then being shipped into the United States. Trudeau announced increased funding and border vigilance "to prevent transshipment and diversion of unfairly priced foreign steel and aluminum into the North American market," according to a statement released in April. It was the understanding of Canadians officials at the time that this would satisfy the Trump administration and allow for Canada to receive a permanent exemption from tariffs. Just days before Trudeau is set to host a G7 Summit in Quebec, Canadian officials tell CNN they are just trying to "keep Trump happy." Asked about Trump's remark that the Canadians burned down the White House, aides to the President and to Canada's Trudeau declined to comment.